A couple of months ago, the guys in the XtremeSystems World Community Grid forum reminded me of how wonderfully inexpensive old Intel server hardware has become... so, without further ado, I bring you a $200 quad-core system (just add a hard drive, E-ATX compatible case [optional], and video card [optional]). 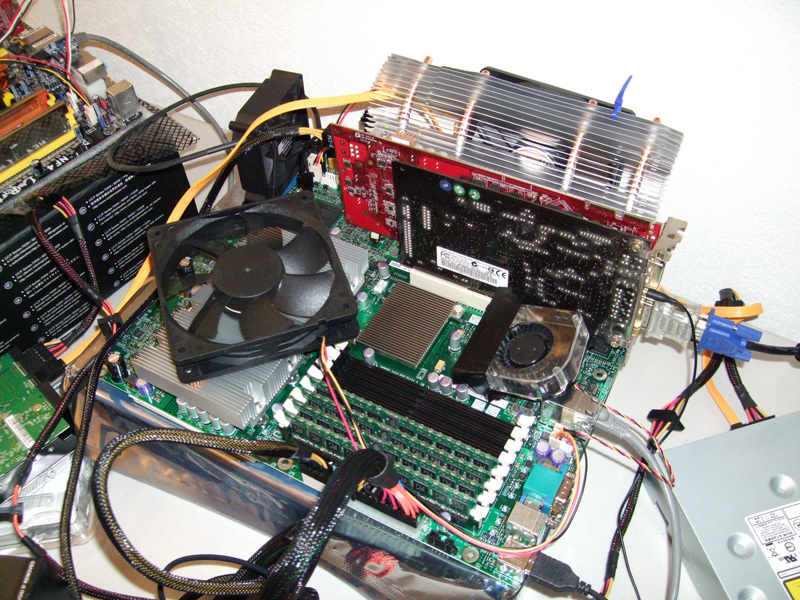 Way back in 2006, the tech industry was clamoring for a cool and efficient alternative to Intel's lineup of 95W+ TDP NetBurst-based Xeon processors. Intel, having just released single and dual-core Yonah variants (based on the Dothan Pentium M CPUs) for the desktop/mobile market, responded by adapting the dual-core Yonah for multi-socket applications and adding support for 36-bit memory addressing. Thus, the 31W (Xeon LV) and 15W (Xeon ULV) dual-core Sossaman was born. The tidbit that I find most interesting about the Sossaman/Yonah/Dothan CPUs is that they're, essentially, an evolution of the old Pentium Pro's P6 microarchitecture. Anyway, getting back on track, the Sossaman and Yonah CPUs turned out to be very, very short-lived products for Intel, as they were used as stepping stones to reach what we now know as the Intel Core microarchitecture. The greatest shortcoming of the Sossaman/Yonah CPUs is their lack of x86-64 support and it was this key shortcoming which contributed to their short, dead-end lifecycle. So, what does all of this mean to enthusiasts? Well, since the Sossaman is a 32-bit only dead-end product (there is no upgrade path), it's not something which the IT industry has a demand for. What happens to old computer tech that is no longer in demand (come on, everyone should know this one by now)? It becomes dirt cheap! Simply add a spare HDD and you're good to go since the motherboard is equipped with onboard video (VGA). Granted, the onboard GPU is an old ATI Rage XL... so don't expect much from it. The board does have a PCI-e v1.x 8x slot, though, which can be modified to accommodate a PCI-e 16x video card--all you have to do is carefully hack off a portion of the motherboard's PCI-e 8x connector. Now, since it's only a v1.x 8x slot, throughput will be limited and this is something which will be noticeable with cards much faster than an HD4850 or GTX260 (throughput is so limited, in fact, that overclocking said cards results in almost no appreciable performance gain in 3DMark). The above system should be able to score about 9600 points in 3DMark '06 when running with an HD4850. If you're one of those folks who enjoys having their computer make sounds, then you'll have to invest in a used sound card (I managed to score an Audigy 2 ZS from an XS forum member for $30) or pick up a random cheap one. It's about now that I should probably mention that the hardest part of this build is tracking down those Xeon SL8WT processors at a reasonable price. There may not be a significant industry demand for these parts anymore, but there's no shortage of scalpers on eBay hoping to gouge some poor IT guy in need of a replacement part. They do pop up in bulk at sane prices from time to time, but you'll have to be patient and vigilant. There's SammyOne during its caseless testing phase. In case you're wondering about the name, yes, I have two of these things now (one on Vista, one on Ubuntu) and have even replaced my gaming rig with SammyOne (Phobos will be hitting Craigslist shortly). Using World Community Grid output as a benchmark, this Sossaman system isn't that much less powerful than Phobos' E8400 running at 3.6GHz (~10,213 WCG PPD vs. ~9,000 WCG PPD), it uses substantially less power, produces far less heat, and has been handling daily use multitasking quite well (maybe even a bit better than Phobos when BOINC is running). I'll update this post tomorrow with a photo of SammyOne in its long-term home: a Stacker 832. Eventually, I hope to cram both SammyOne and SammyTwo into the same Stacker 832 case through modifying the hinged fan carrier to accommodate a ghetto-fab acrylic E-ATX motherboard tray. Update: Here are those photos I promised (TwitPic thumbnails, click to view the whole photo). For those of you who don't keep track of my Twitter account, I added a few of my photos from last weekend's trip to the Willow Springs International Raceway to TwitPic. The gallery of thumbnails can be viewed here (just click the thumbnails to view the whole image and enlarge).